A huge thank you to Ann Hackett for her hospitality and expertise in hosting/teaching Farmstead Cheesemaking. The ancient Swiss Alps method of cheesemaking requires a season of 100 days of manual labor. The summer, so hot in the valley, was the perfect season to take the herds into the mountains. There was plentiful wildflowers, grasses, and herbs to forage. The cheesemaker could work with the herd to capture the nutrients of the season and provide for the community through the winter. They did this by turning milk into one of mankind’s oldest foods: cheese! Milk contains all nutrition you need to stay alive, and turning that milk into cheese is a way of preserving that nutrition. Mountain cheeses are a bit of sun on a winter’s day. In Homer, such old time cheesemaking traditions are being fostered. Ann Hackett teaches her cheesemaking workshop on her farmstead down East End Road. As you walk up towards the farm, curious goats meander toward you, ducks flee in their funny, synchronized flaps and squawks. .
Ann has had a herd for 15 years, so she knows her stuff. The goats are a half breed that produce a surprising amount of milk. They munch on wildflowers, grasses, and herbs. They’re milked twice a day for eight months. All good cheese starts with good quality milk, and what makes good milk depends on good feed, good health, good environment, and lack of stress on the animals. It takes a while to make cheese, so we start early. We were going to make feta from scratch, as well as finish up some chevre. 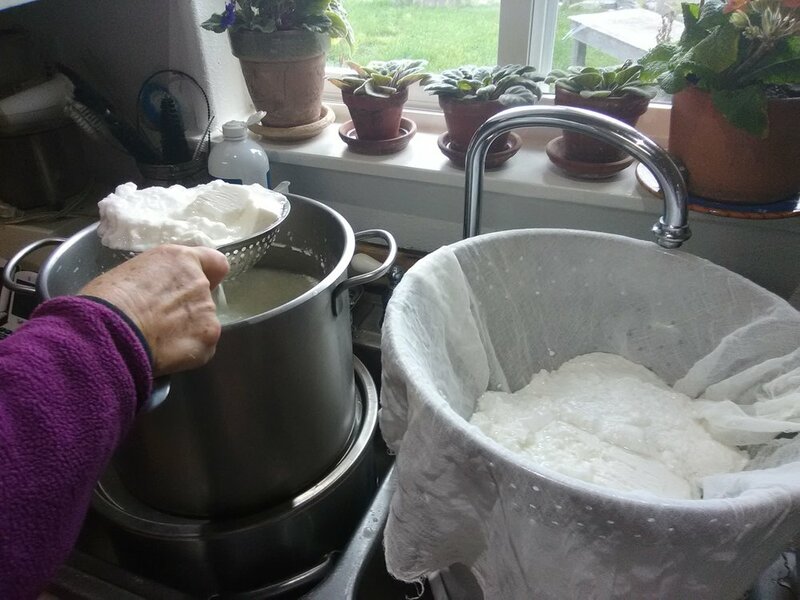 In between following strict temperature and time protocols, Ann, a wealth of knowledge, shares information from the best website to order cheesemaking supplies to ancient Italian aging techniques. Along the way we ended up sneaking in paneer making and ricotta cheese as well. Instruction from Ann Hackett’s class. To start our feta from scratch, Ann took out two jugs of her goat’s milk, unadulterated from her herd. This means raw and unpasteurized. First step is to warm the milk to 86 degrees and add in a starter culture and lipase. Once the milk is poured, microbial culture is added. Starter culture its called. The cultures are microorganisms that are eating the sugar lactose in the milk and producing lactic acid, in a lacto fermentation. In old world European methods, the barrels are made of wood, the better to hold in microbial culture. Or, one might use cultured whey from a previous batch. Much like continuing a sourdough bread culture, cultured milk contains live probiotics, especially if it’s raw. In class today we are using starter culture specifically designed for feta. We wait 45 minutes for the starter culture to work it’s magic. At this point, rennet is added, an enzyme that causes the milk to coagulate. Rennet for cheesemaking was made for a long time from the stomach of suckling calves. Since digestion turns milk into cheese, consumption of milk technically predates humanity, starting with the first mammals. The stomach acid of a prehistoric baby mammal nursing separated the whey and curds of milk. How did we ever find this out? It is believed that ancient humans carried milk in the dried stomach of animals, and that on a hot day it curdled, and they found that it both was edible and preserved longer. Rennet is a protease enzyme that causes the proteins in the milk to coagulate, causing it to separate into solids (curds) and liquid (whey). Don’t worry, nowadays, rennet can be extracted from lots of different, including vegan, sources. Even non-GMO fungal sources, or vegetarian options like nettle and yarrow. When we peer under the lid 45 minutes later, it’s an amazingly different consistency. The rennet has done it’s job. The milk has turned from pure liquid into curds and whey. The next step is to cut the curd: this separates the curd from the whey. After cutting the curd, you must mix it up every ten minutes while alternately letting it sit still. Interspersed between the ten minute cheese stirring intervals, we watch videos of professional and artisanal cheesemakers around the world. Ann carefully selects video topics that are thought provoking - raw milk, methods of sterilization, best equipment, and cultures (both microbial and human) are all thoroughly discussed. Every ten minutes we give it another swirl. Next, the curds must be scooped out and strained through a cheesecloth. The curds are pressed into small molds. For feta, we use small plastic molds, though anything could be used. The remaining whey can be cultured as well, into ricotta cheese. “If something doesn’t turn out the way you want it, you still can make it work. If the whey doesn’t form ricotta, just make a delicious probiotic buttermilk dressing”, she says. The point is to use the cultured milk with all it’s life sustaining nutrition. Next, the curds must be placed into molds. 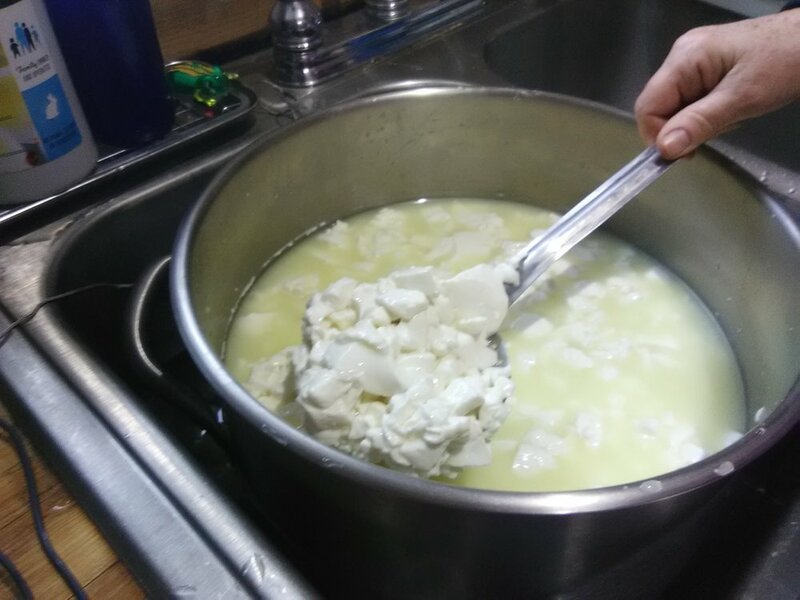 In this feta method, the weight of the curds themselves is what ends up pressing out more of the whey and pressing them into each other; it knits itself together. It works surprisingly well, and quickly. An hour later they were ready to flip, and had already formed their own unique masses. Before air drying, they need to be salted. If you didn’t leave near the sea and had access to salt, such as in old time chèvre making in France, you’d use ash. They can age for as long as you desire. Traditionally, as cheese ages in caves, it begins to change pH, and as it ages, new microorganisms take root to imbue it with even more and subtler flavor profiles. Cheese, it turns out, is very much alive. It’s its own ecosystem. As many as 2000 species of organisms can be thriving on cheese. This battalion of probiotic bacteria keeps the bad ones at bay. Aging the cheese brings together pollens, molds, and yeast in the air, and incorporates them into the flavor of the cheese. This is where the countless variations of texture, flavor, and consistency arise; from the terroir not just of the grasses, animals, and milk, but from a wild microbial array growing on the cheese. The final feta of the process is tangy, salty, and delicious. It seems to taste all the better when you’re sitting on the same farm it came from. Whether terroir is detectable or not could be debated, but the knowledge of the place, animals, and creative labor that goes into the cheese seems to add a sweet flavor indeed. Ann sent us off with a dizzying amount of information, bidding us each farewell with a little party favor bag of starter culture and lipase and rennet and chunks of chèvre and feta to take home, plus lists of resources and websites and recipes and milk shares. It’s a curious narrative nowadays - people are heading back to the land to produce artisanal food products. Books adorn shelves with titles like: “One city-dweller’s radical move to the country!” “Couple drops all to invest in small family farm!”. Artisanal cheesemakers are on the rise. Real cheese is making a comeback. One cheesemaker calls it America’s cheese revolution. An artisan revival of dairy heritage. A resurgence of connection to people and place. Historically, traditional local cheese said quite a bit about the person who made it; their identity. If they produced Cheddar cheese it meant they were from Somerset County in the United Kingdom, nearby Cheddar Gorge, that they were milking cows, and had access to salt. Your regional cheese spoke of where you were from: your geography, kin and home. Your belonging in the word. In the same way, making local cheese could be a connection of people and place. Caring for the goats, working with their cycles, milking them, utilizing their nutritious milk in the best way you know how. Working with its textures and flavors, coaxing something delicious out of your environment with your ingenuity and perseverance. Food in context becomes a story. Deeply satisfying; cheese for the soul. 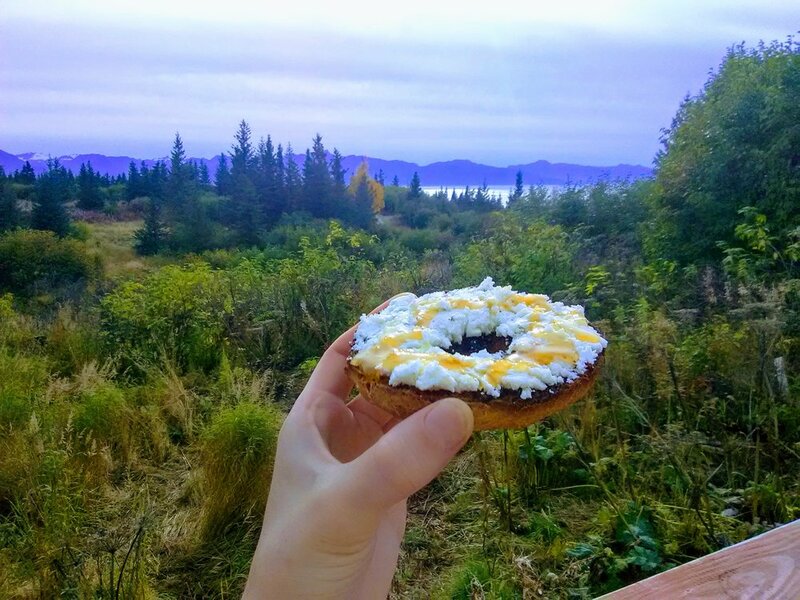 An Alaskan breakfast: goat milk chevre drizzled with local honey. Yum!